$159 is a whole lot of money to spend on headphones that you can’t even fully enjoy. Since Apple decided to make the tips out of smooth plastic instead of grippy silicone, they don’t isolate sound and all that great bass leaks right out of your ears. Then you have the SoundPEATS True Wireless Bluetooth Earbuds, which have silicone tips and cost just $30. They keep all that great sound locked in your ears so you don’t leak and bass and your music sounds as good as you want it to. For $159, Apple should’ve been able to do the same. 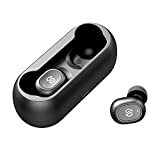 [TWS & BLUETOOTH 5.0] – Adopt global professional Realtek chipset, true wireless design with latest Bluetooth 5.0, the SoundPEATS TrueFree wireless earbuds own fast and stable transmission without tangling. [SINGLE & COUPLE] – Support working together to enjoy stereo sound, or using one earbud only for preference or driving safety. Different from the previous version or other brand, the TrueFree wireless earbuds provide HiFi stereo sound at both music and phone calls. [ONE-STEP PAIRING] – Born to offer you every convenience, the earbuds are built with very easy operation. Pull out the earbuds from charging case and hit on Bluetooth list. That’s how easily you get the earbuds paired. [EXTENDED PLAYTIME] – Compact and lightweight magnetic charging case for you to carry the earbuds around. 3.5 hours playtime per charge and 15 hours in total, the earbuds strive to keep you company longer. [BIG IN SMALL] – SoundPEATS TrueFree wireless earbuds fulfill all your fantasy and needs about Bluetooth earphones. As long as your device is with Bluetooth version above 4.0, you can use it with the earbuds. SoundPEATS provides 12 months hassle-free warranty to ensure the enjoyment of your purchase.